Want to learn about Government incentives for Electric Cars! 25% off the cost of the car up to a maximum of £5000. 20% off the cost of a van up to a maximum of £8000. These grants apply to any vehicle that can be charged by electricity and are based on the cost you would pay for the full purchase price of the vehicle including number plates, any duty and VAT, but does not include optional extras i.e. delivery charges. 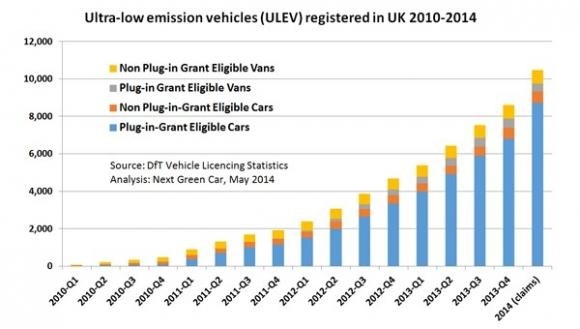 Likely vehicles to be eligible for this grant are electric vehicles (EV’s) as these run on battery power only and are charged by plugging the vehicle into the mains. Plug in hybrid electric vehicles (PHEV’s) these hybrid vehicles use a petrol or diesel combustion engine combined with batteries that plug into the mains. Other technologies for example hydrogen fuel cell vehicles are also eligible. CO2 emissions must be less than 75 g per kilometre, electric vehicles must be able to travel a minimum of 70 miles between charges. Plug-in hybrid electric vehicles must have a minimum electric range of 10 miles. A minimum top speed of 60 mph must be achievable, the manufacturer must offer a minimum three-year or 60,000 mile vehicle warranty and a minimum of three years battery and electric drivetrain warranty. Vehicles must have either a minimum five year warranty on the battery and electric drive train as standard or extra evidence of battery performance to show reasonable performance after three years use. Vehicles must comply with the electrical safety requirements and show that they are electrically safe. Vehicles must be approved by the European Commission, whole vehicle type approval or have evidence that the car has appropriate levels of safety judged by international standards. For van eligibility the vehicle must because within the N1 category as defined under the EU directive, and have a gross weight of 3.5 tonnes or less. The CO2 emissions must be less than 75 g per kilometre driven, with a minimum top speed of 60 mph and for plug-in hybrid electric vehicles a minimum range of 10 miles. The top speed for a commercial vehicle must be greater than 50 mph and vehicles must have a minimum three-year or 60,000 mile vehicle warranty guaranteed. A minimum of three-year battery and electric drivetrain warranty must also be provided. The vehicle must have either a minimum five year warranty on the battery and electric drivetrain, and must comply with certain regulations to show that the vehicle was electrically safe and all crash safety regulations must also be met. The claim for the grants will be automatically deducted from the purchase price of the car or van. This will be done by the dealership who will complete the paper paperwork, you will not require to fill in any forms however you may be required to complete some questionnaires. The Office For Low Emission Vehicles is also funding for domestic charge points click the link for further information. You can claim capital allowance on cars you buy and use for business use. This allows you to claim a proportion of the cost of the vehicle against your pre-tax profits at the end of the financial year. A car is considered to be suitable for private use including motorhomes, as something that most people use privately and was not built for the transportation of goods. Motorcycles bought prior to 6 April 2009 do not count, lorries vans and trucks do not count. Vehicles with CO2 emissions of 95 g per kilometre or less, or electric providing they are new and unused may claim first-year allowances. Assets that qualifies of first-year allowances, will allow you to deduct the full cost from your profits before tax. This can be claimed in addition to annual investment allowance. The vehicle must be purchased between 1st April 2013 to the 31st March 2015 and your claim will be processed on your tax return. If you failed to claim the first year allowance, you may claim part of the cost in the next accounting period. Vehicles with CO2 emissions of 130 g per kilometre or less or electric vehicles (with CO2 of 95 g per kilometre or less if they are second-hand) may claim the main rate allowance. The rates for these claims are considered to be the Main Pool Rate at a rate of 18%. The claim would need to be processed as part of your year-end tax return and should be approved by a qualified accountant. Vehicles with CO2 emissions of more than 130 g per kilometre have to be claimed at the Special Rate Pool set at 8%. Sole trader’s or partners can claim simplified mileage expenses business vehicles providing that they have not claimed for in other ways. For cars and good vehicles the first 10,000 miles can be claimed at 45p per mile, after 10,000 miles the claim amount goes down to 25p per mile. For motorcycles the claim amount is set to 24p per mile. The claim should be processed as part of your self-assessment tax return at the end of the financial year. Employees who can’t claim capital allowance for cars and motorbikes or bicycles but use them for work may be able to claim business mileage and fuel costs. Tax relief is calculated by adding up your business miles from the tax year and multiplying them by the approved mileage rates stated above. If your employer doesn’t pay your mileage allowance, you can claim the full approved amount of mileage allowance relief. If your employer pays your mileage allowance but it’s less than the approved amount you can claim the difference. Electric vehicles are also exempt from congestion charge, among other benefits.